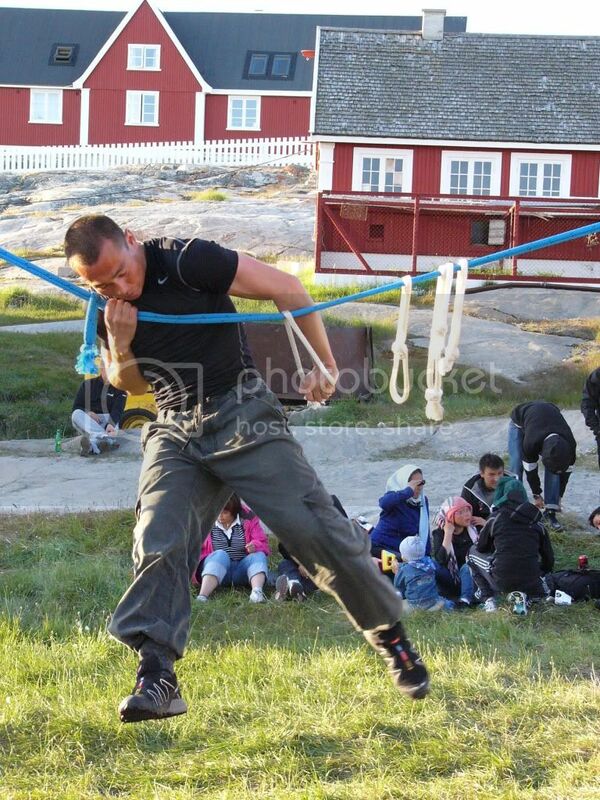 One item that was going on through much of the competition was the ropes competition. A few of the moves simulate rolling an actual kayak, but many of the moves are simply winter-time one-upmanship. 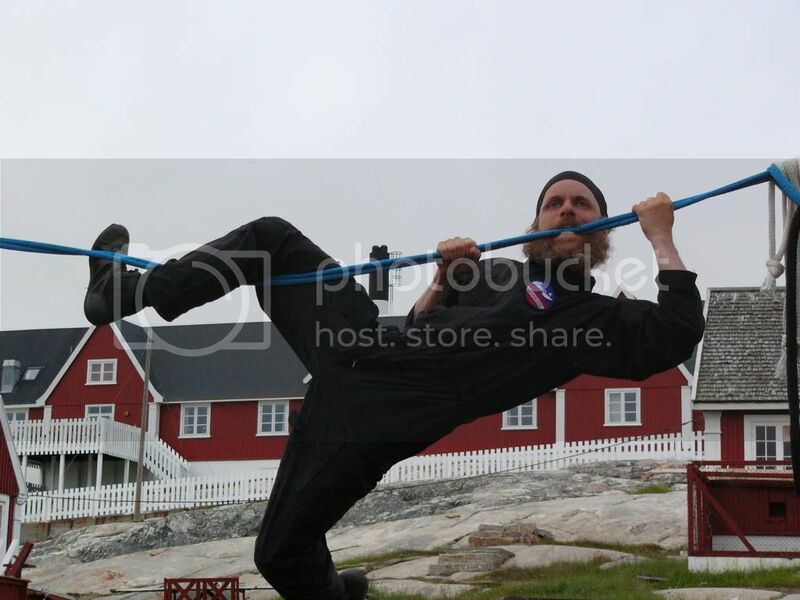 While many Greenlanders may not know how to roll their kayak, many more Greenlanders can at least get the minimum number of points on the ropes (30 for men, 20 for women). These moves can be done indoors throughout the year and pose a much lower risk than learning to roll in frigid waters in limited shared gear. They are also a fun way for kids to play. The kids started early in the week and, when people weren’t competing, the kids could often be seen playing on the ropes. Each participant is given 30 minutes to go through the maneuvers they know. 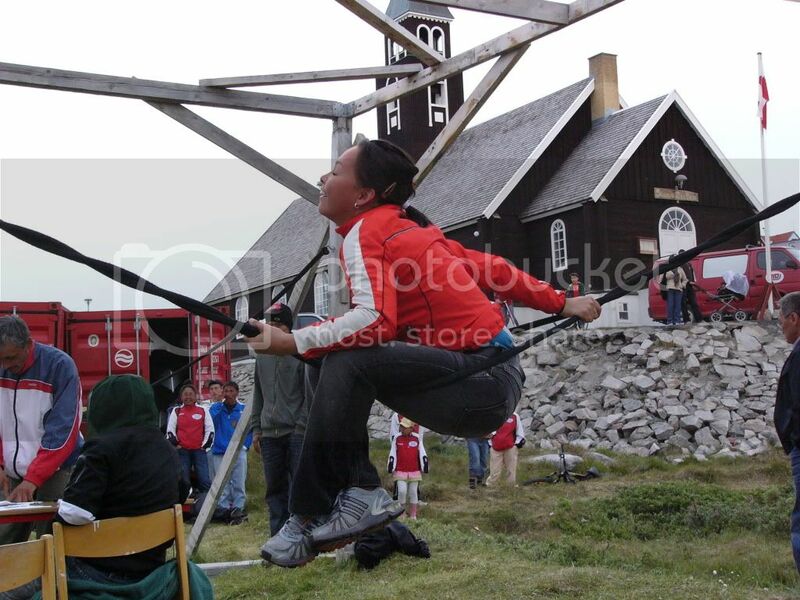 There are a number of moves done on the low ropes, and then you move on to the high ropes. It used to be that you could jump around between rope maneuvers but they’ve changed it so that you have to move through the maneuvers in order; you can skip moves if desired, but you can’t return to them once skipped. This makes more sense from a judging perspective, but it also means that the hardest moves are last, when you’re exhausted from all the previous moves. While I had set up ropes at home in hopes of working towards a minimum number of points (which I thought was 30 at the time), a number of unexpected trips left me with little opportunity to build up enough moves on the ropes. Ropes are HARD! Watching the women perform made me feel a lot better about the few moves I can do. 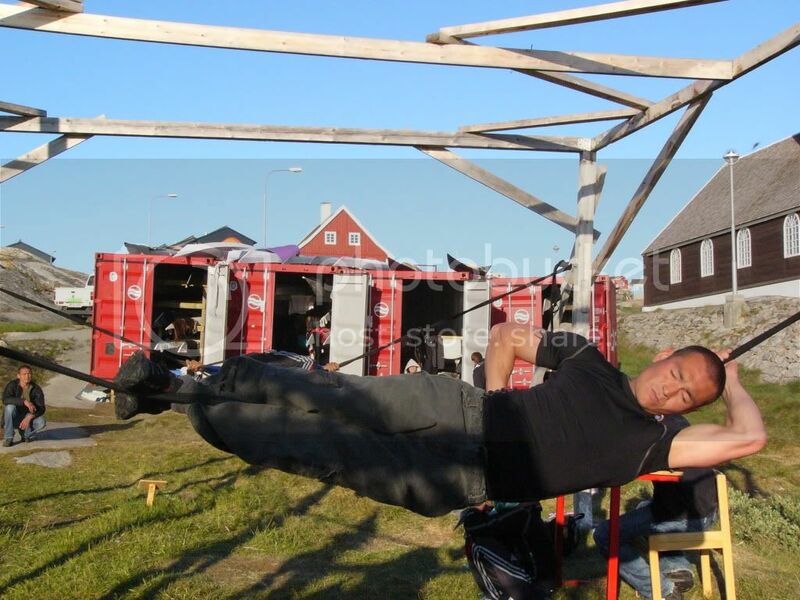 I was really struggling with a number of moves, especially those that require a lot of upper body strength. 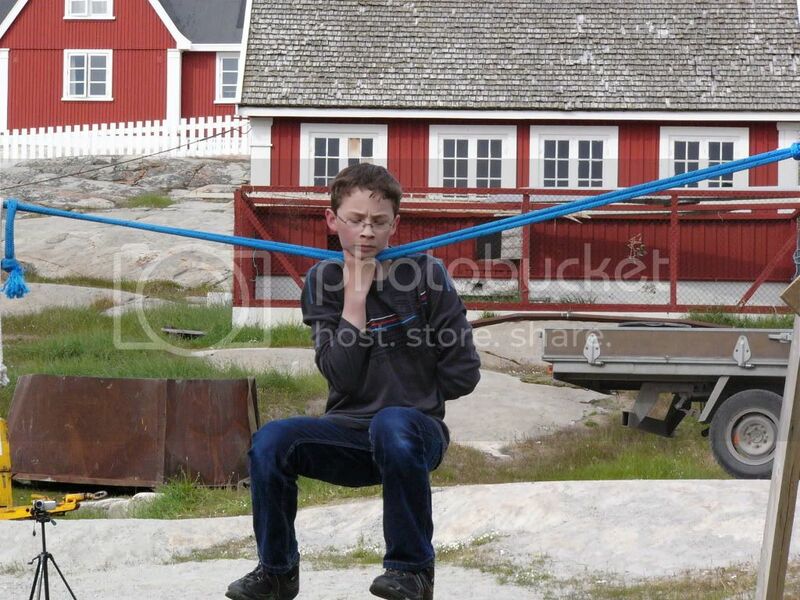 After watching many people compete on the ropes, I quickly realized that it wasn’t just me. Women do not really have the right physique to do many of the moves. 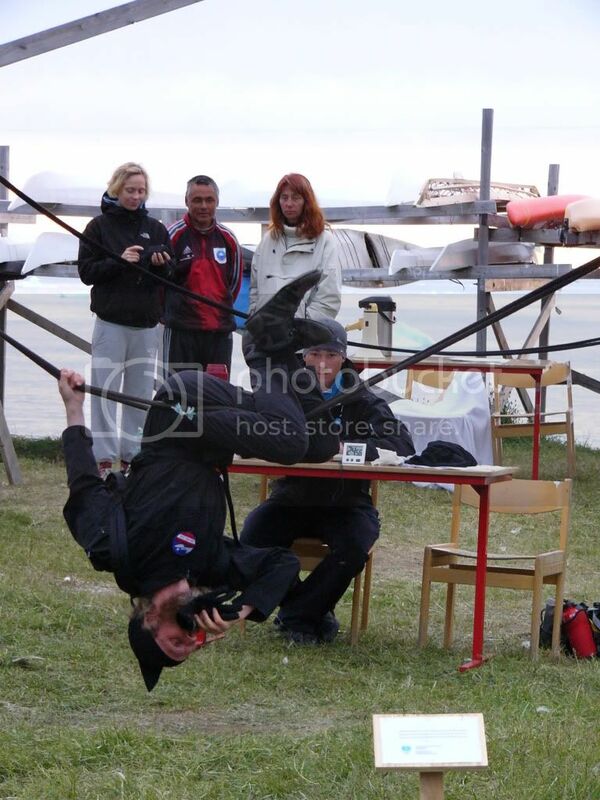 Looking at the results, the highest scoring woman (220 points) was nearly 300 points away from the top scoring Greenland man (509 points), and she would have scored 7th in the men’s group. As I watched them, I saw that the girls skipped many of the moves I wasn’t able to do, and moved onto others that required a bit more leg strength rather than arm strength. The most amazing performer was Dubside. He scored a world record 721 points, over 200 points higher than the highest scoring Greenlander! Unfortunately, my one regret of the whole trip was not bringing down Richard’s video camera when Dubside performed. A recording of him on ropes would have been worth a lot I’m sure! He set everything up and the instant the clock started he was on the ropes, quickly moving from one move to the next. By the time he was on to his 8th or 9th move many of the Greenlanders were riveted, but one jokester was hollering for him to slow down and take it easy. Dubside clearly had a routine, and he moved straight through it; no audience comment would deter his focus. Soon enough, he was on to the high ropes. He had his own clock that he kept an eye on and as he got towards the more difficult moves he did take occasional quick breaks. Near the end, he also played to the audience a little bit when he announced that he would do the pinky maneuver. 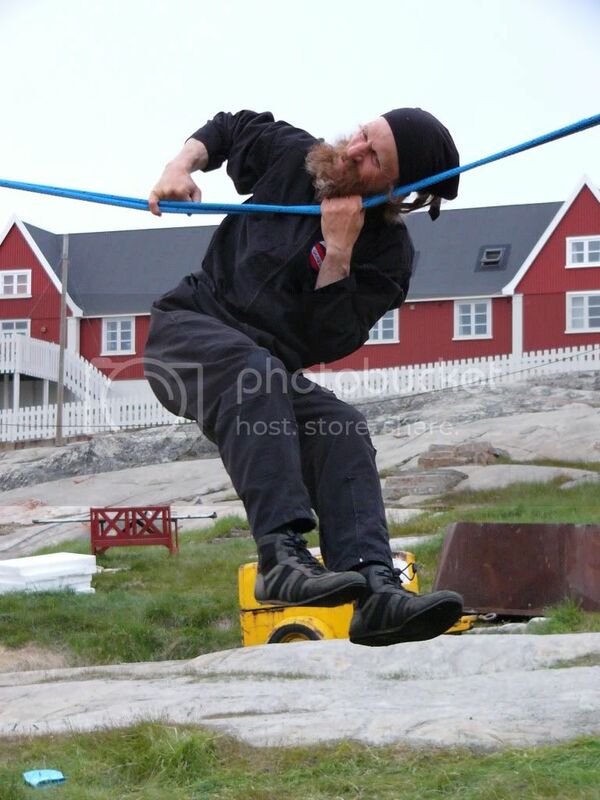 I was always intrigued by the multiple maneuvers that biting the rope while pulling yourself up and over the rope. Ropes take a lot of balance and a true ropes person can work on the ropes and make it look easy. Many of us try to get on the ropes and the ropes shake like crazy, an experience person sits on the ropes and the ropes sit perfectly still. I’ll have to go back to working on the ropes to see if I can steady the ropes and develop some skills. Maligiaq put in a decent performance as well. 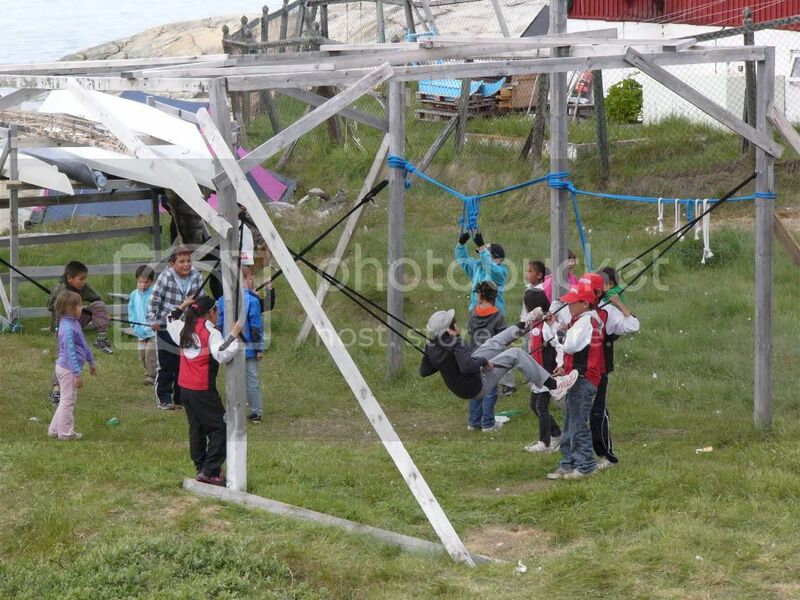 Again, the schedule gets moved around sometimes and Maligiaq's group ended up having to perform ropes the same day they did the portage race so needless to say they were already exhausted from that event earlier in the day. Dubside kept score of many of the competitors and, similar to my harpoons results, it sounds like it is possible that some scores may have been totalled incorrectly. Unfortunately, individual score sheets are unavailable at this point for review, so there is no way to compare his results to the actual results.